Northern Lights is a sauna and spa manufacturer based in Belgium that creates some of the most innovative saunas and hot tubs in the world. While the company has European roots, they have developed their enterprise to cover much of the Americas and Asia as well. One of the only issues associated with the Northern Lights brand is the fact that they offer only two different types of saunas – the barrel sauna and the indoor hybrid sauna. 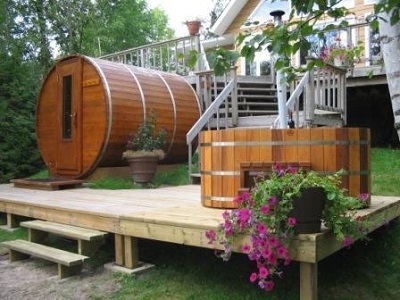 When it comes to saunas, not many manufacturers have perfected the barrel sauna the way that Northern Lights has. Thousands of satisfied customers and sauna connoisseurs have chimed in to voice their approval of the incredible visual appeal, interior design, and effectiveness provided by their cedar wood barrel saunas. They do an amazing job of toeing the line between innovative technology and tradition while creating one of the best outdoor saunas in the world. Both of the sauna options that Northern Lights offers are designed to be self constructed by the customer. While this process can be difficult, multiple past customers have talked about how incredibly helpful the customer service team at Northern Lights is. With corporate offices in three different countries, it’s easy to see that the brand is dedicated to providing top notch service to customers throughout the world. The significantly high level of customer service provided by the Northern Lights brand is one of the main reasons that they have become such a popular worldwide sauna company despite their lack of options. That certainly isn’t to say, however, that their products aren’t top notch as well. Customers looking for the peace of mind of a friendly customer service staff and high quality sauna will be thrilled with what the Northern Lights brand can provide.